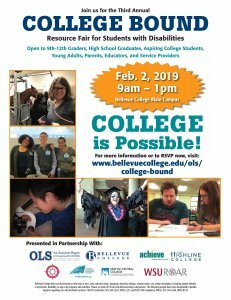 The College Bound Resource Fair is a unique event created specifically for people with disabilities who aspire to become college students and the families and educators in their lives. The event includes presentations and resources on college programs, preparing for college, transportation, financing college, advocacy and independence, academic support, and much more! College Bound is free to attend and is open to 9th-12th graders, high school graduates, adults and young adults who aspire to go to college, families, educators, and service providers. We hope you can join us!